Indeed Tiwa Savage is one of the hardest working women in the Music Industry, but to Wizkid, she's the hardest working female musician he knows... cough cough. 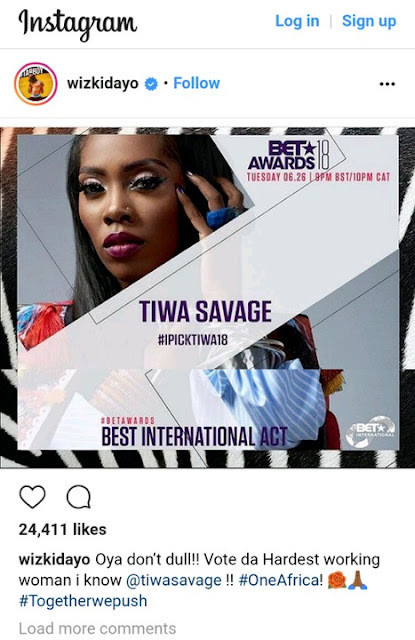 He shared her official BET nomination photo with the hashtags "OneAfrica" and "TogetherWePush"
Wizkid has urge his fans to vote for Tiwa Savage, because she's hardworking. Her alleged lover, Wizkid, has urged his fans via Instagram to vote for her because he feels she worked hard for it. We pray they bring the award home to us.